Fasten your seat belts people, because what you’re about to see is proof of my first successful bake in over 3 MONTHS! That’s huge. Because if you know my oven, you know that it’s completely wretched and should be donated to a museum or something. That beast is a million years old…takes over an hour to heat up… and is exactly 120 degrees off. So, let’s just say that it is not the most user friendly appliance in my kitchen especially when you forget to fasten the hook. Oh, yes the hook. You know, the thing that keeps the oven door from shooting open like a jack-in-the-box? Ah, yes. Leave it to a small child to rope you into the ultimate guilt trip. On Wednesday, I decided to stop the pity party and to start baking again. For the kids. For me. I knew that if I was going to commit to this cumbersome task, I would do it right and bake more than just one recipe. The plan was to bake several things at once to take advantage of time and electricity. I would be The Clever Bakery. I made these buttermilk blueberry crumb muffins, a zucchini cake, and a lemon poppy seed loaf. This is your topping. The topping that you will methodically eat first when devouring your muffins. It is also very messy. Do yourself a favor, and find a bigger bowl than I did because you have to mix everything together with your hands. You will need more room than you think. I lightly flavored this one with cinnamon because I love the combination of blueberries and cinnamon. 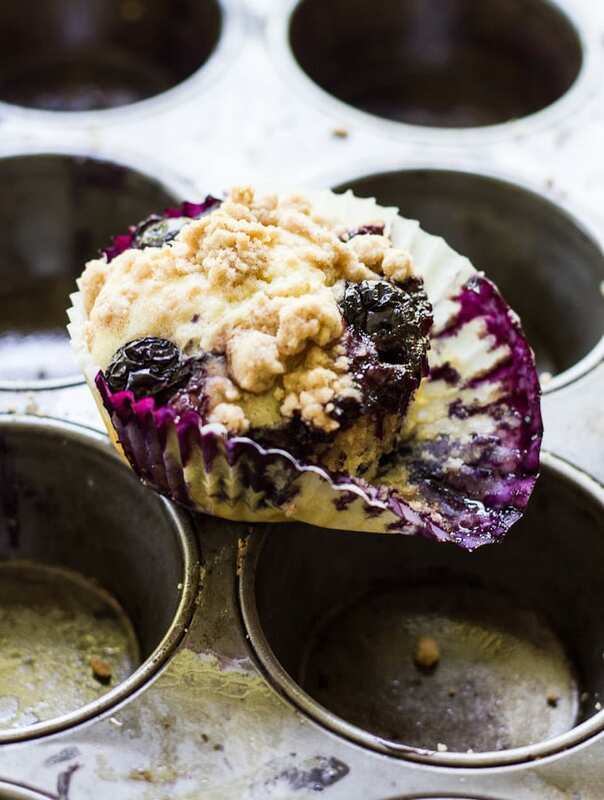 If you read this post, you’ll know that I’m very picky about blueberry muffins. Although the blueberry cornmeal recipe is my usual go-to, this version is a wonderful alternative. The addition of buttermilk replaces most of the fat and adds a slight richness to the batter. The cinnamon-crumb topping creates a delicious crunchy texture just begging to be picked at. It’s the perfect amount of tart and sweet. My secret is to use salted butter for the crumb topping. It adds just the right amount of flavor. Don’t skip this! 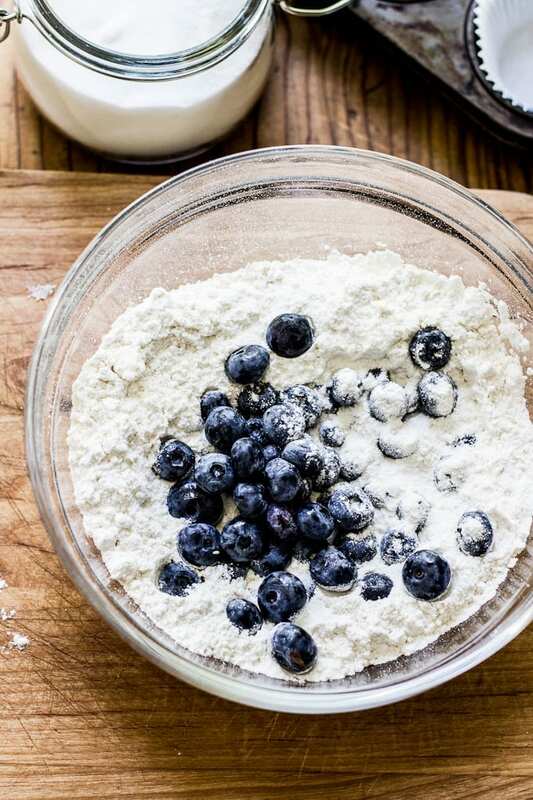 If using store-bought frozen blueberries, your batter will turn slightly blue/purple in color when mixing (it’s from the residual moisture). This is completely normal and will not affect the look and taste of your muffins. * My secret is to use salted butter for the crumb topping to add extra flavor. 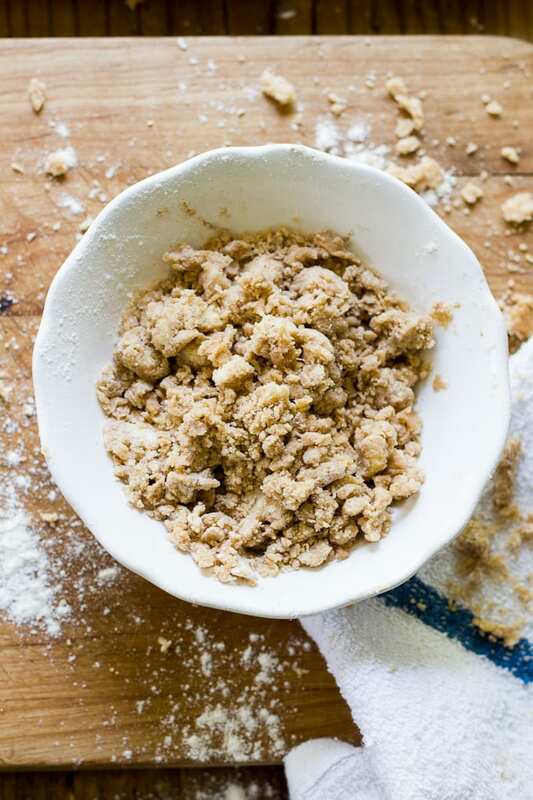 To make the crumb topping, add all of the ingredients to a large bowl. Mix together with your hands until you have chunky crumbs. Refrigerate until ready to use. 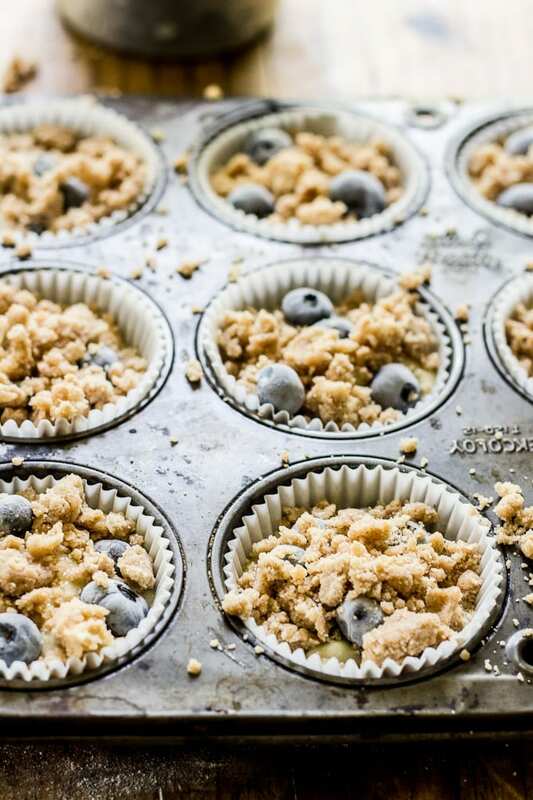 Preheat your oven to 375 F. Line a 12 cup muffin tin with paper cups. In a large bowl sift together the flour, baking powder, and salt. Add the blueberries and toss gently with a spoon to coat. In another bowl, whisk together all of the wet ingredients until thoroughly incorporated and the sugar crystals have dissolved. Gently combine the dry and wet ingredients. 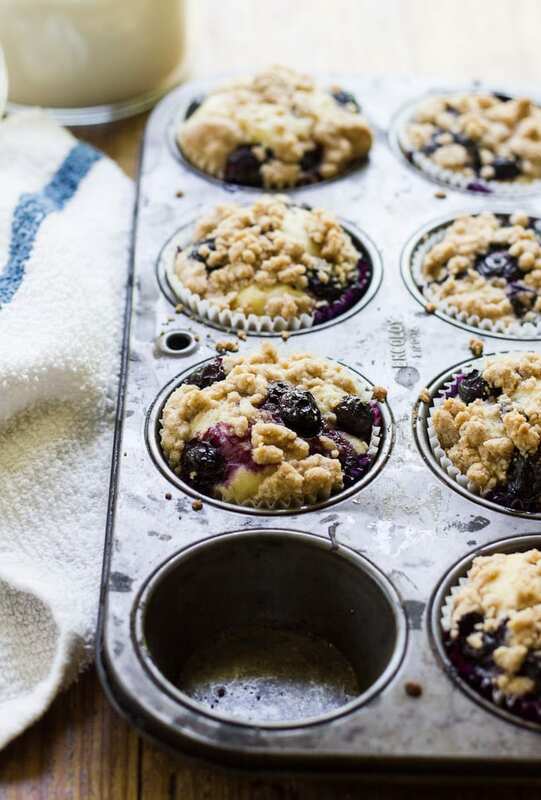 Try not to break up the blueberries or over mix the batter; you will have tough muffins. 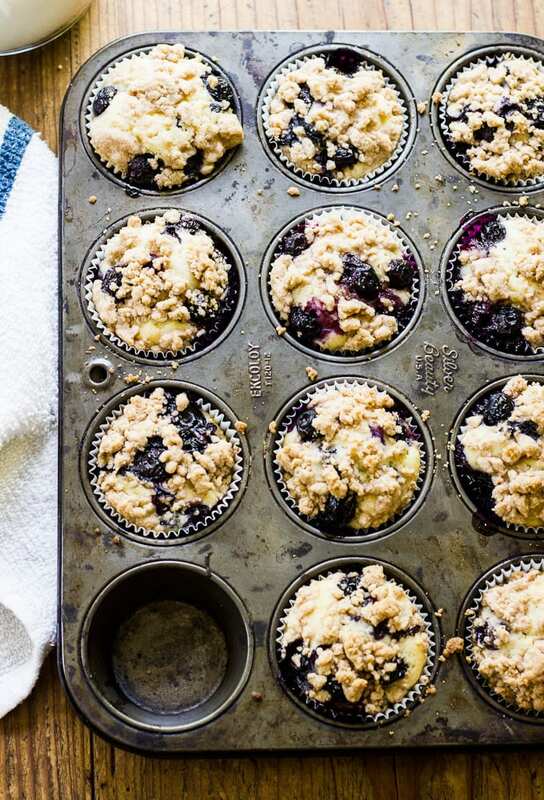 Spoon the batter into your muffin cups, about ⅔'s full. You should be able to get 10-12 muffins. 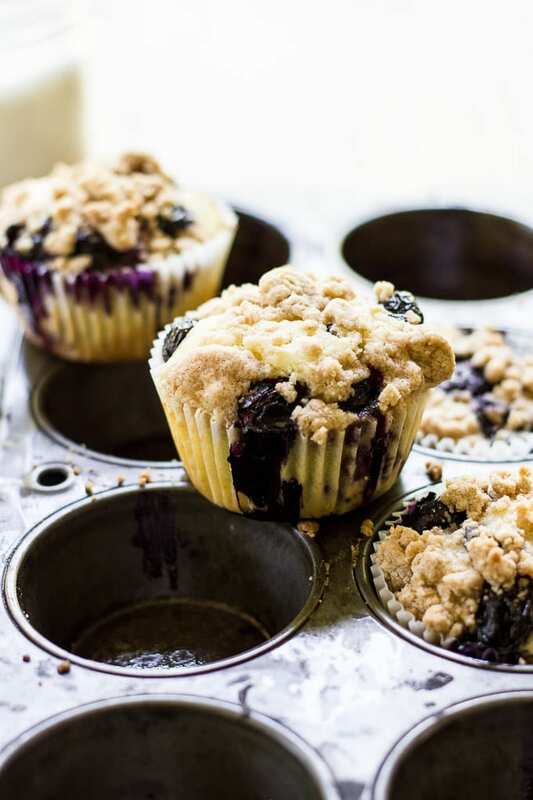 Sprinkle some of the crumb topping over each muffin. Gently press 3-4 blueberries into the batter. 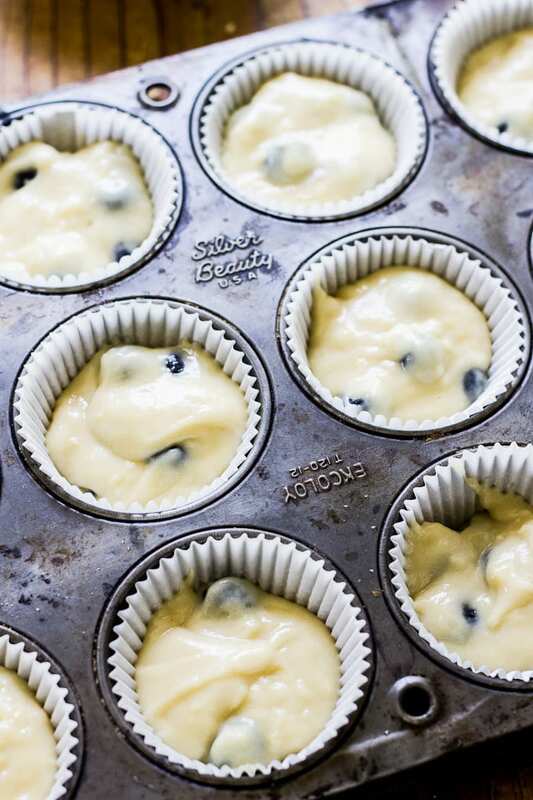 Bake for 15-20 minutes, or when a toothpick comes out clean (blueberry juice is ok) when inserted. Such gorgeous muffins, I’m in love with that crumb topping! Oh, but i had to laugh. I had an oven like that once – what I had to go through to bake and roast was nothing short of Herculean. The hardest part was keeping that darn door closed! This made me laugh. Then it made me lust for your Blueberry Muffins. They look delightful! P.S. I am thinking maybe Santa needs to bring you a new oven for the holidays…. The crumbs are definitely my favorite part! Yummy! These look incredible! And I had to laugh about the “taking advantage of time and electricity part”. Isn’t that how it goes? If I have set aside time to bake I’m going to multi-task, dang it!